Virgil’s All Natural Soda comes in a wide variety of flavors that not only taste good but are made from great ingredients. Already a fan of the Virgil’s line of sodas I jumped when I came across a flavor I haven’t tried, Peach Lemonade. With money exchanged and exuberance building, I return to my lair and placed the bottle’s contents on ice and set out to drink something for which I have high expectations. To be honest I really haven’t had the best experience with peach flavoring before. So with that being said I pour a full glass and take the first sip somewhat apprehensive about what I might find. Both peach and lemonade flavors are clearly discernible and create a unique combination of sweet and tart. No aftertaste is discernible which is great. So I take another sip. The flavor remains constant as does the carbonation. The Peach flavor seems a little strong the more I drink but it isn’t overpowering. I sense flavors other than just peach and lemonade at this point so I grab the bottle and search the fine print for a list of ingredients. Apple, pear, and grape juice are combined in some proportion with peach and lemon flavors to form a tornado of yum. So I set about drinking the rest of the bottle happy that my Virgil’s Peach Lemonade experience is going so well. Now the bottle is finished and I reflect on what I just drank. A unique taste combined with all natural ingredients produced a soda that not only tasted different than what I’ve drank in the past but quenched my thirst as well. 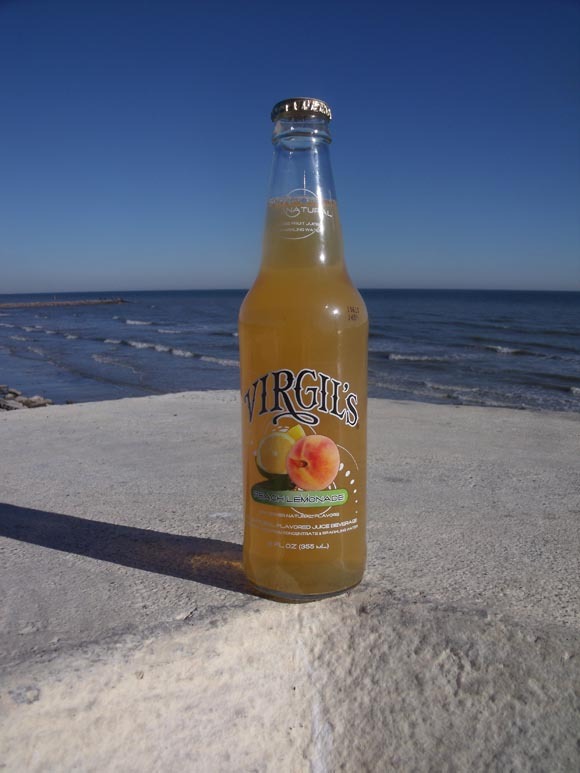 Virgil’s hasn’t disappointed in the past and has certainly lived up to its reputation this time with Peach Lemonade. Who knew that a peach flavor would be so satisfiying? Final Review: Buy a six pack! Virgil’s Peach Lemonade is a good treat no matter what time of the day!